Gandhi provided a moral compass and a non-violent political trajectory to the world but did he fail in whatever he sought to achieve? Was Gandhi a messenger of God? Does Tagore’s lament apply to his case? He was certainly not a messenger if the word is taken to mean reincarnation; he himself had strongly denounced attempts at deifying him. He was, however, certainly so if the word is interpreted in the wider sense of being someone of towering stature spreading God’s message and applying it in practice. Deeply religious, Gandhi tirelessly strove to apply to both personal and public life the values of truth, compassion and non-violence enshrined in all religions. His belief in truth had clearly prompted him to lay bare his weaknesses and inadequacies in My Experiments with Truth. His abiding faith in non-violence had led him to withdraw the non-cooperation movement, then at a high tide, after a mob had burnt alive 22 policemen in the local police station at Chauri Chaura in Uttar Pradesh’s Gorakhpur district on February 4, 1922, thereby courting intense unpopularity in some quarters. The savage communal violence in Noakhali, in which thousands of men were killed, women mass raped and property was systematically damaged on a large scale, shook him to his core. While there might have been other considerations such as continuing to wage his losing war against a partition of India, “it was”, in the words of Harijan, “the cry of outraged womanhood that had peremptorily called him to Noakhali.” The horrible atrocities perpetrated on women en masse had devastated the Mahatma emotionally and deeply violated his sense of morality. Some would consider him to have been a failure by looking at the outcome of what he tried to achieve. He could not stop Partition. Non-violence as a method, which played a major role in mobilising the masses for participation in the freedom struggle, has been swamped by an increasing resort to violent methods that began even before the communal riots had started with the Great Calcutta Killing (August 16-20, 1946). It now receives only lip service. The same goes for the values of truth, which few now seem to consider an end in itself, and compassion which, though not absent, moves a decreasing number of people. From a historical perspective, however, it would be unrealistic to expect a massive transformation of Indian polity and society, and the lives of Indians, along the radically different lines prescribed by Gandhi, in the little over a century since his return to India. More than 2,000 years after the crucifixion, one finds that the ethical principles and conduct that Christ stood for are observed more in the breach in Christian countries. 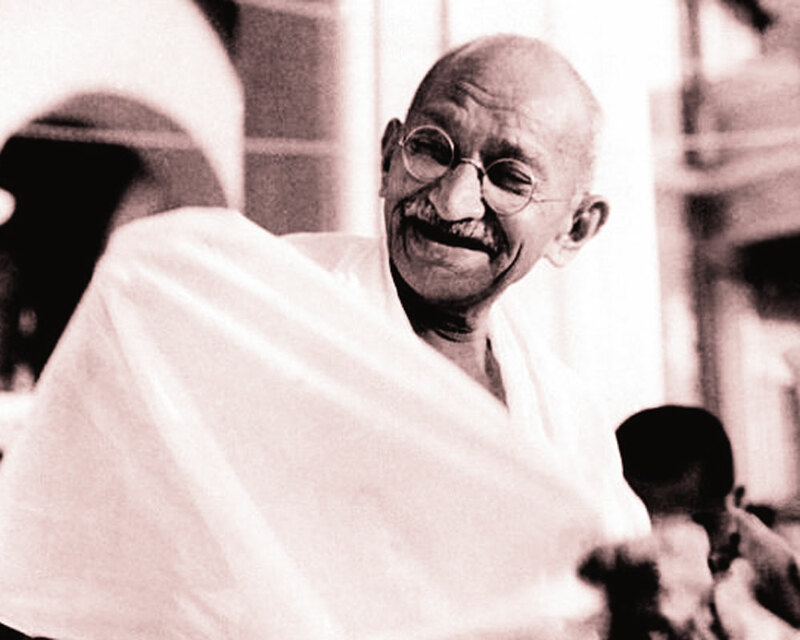 Gandhi has provided a moral compass and a non-violent political trajectory to the world. The indication of the measure of his success would lie in the extent to — and the pace at which — people and nations adopt both. There have been significant developments. The values of truth and non-violence that Gandhi stood for, and the method of non-violent satyagraha that he applied in India’s freedom struggle, had deeply influenced Martin Luther King. His influence on Nelson Mandela is clear from the latter’s statement, made on being awarded the Nobel prize for peace in 1994, that he owed his success to Gandhi. One saw methods of protest, approximating his, in action in Tiananmen Square in Beijing in 1989, in several cities, including Cairo, during the Arab Spring which began in 2010, arousing great hopes that ended in disillusionment, and several other places. Yet, a very great deal of ground remains to be covered. What is needed is an increasingly powerful global mass movement propagating his ideals and implementing them through praxis. The first pre-requisite for its emergence would be keeping his ideals alive through political action, meetings, discussions, talks and writings. All of these continue, albeit primarily within academic precincts. There is also a growing corpus of Gandhiana containing volumes that are scholarly, readable and informative. Particularly needed in the context of a mass movement, however, are books that bring Gandhi to life through photographs and readable prose. One that does this admirably is the historian Aparna Basu’s Gandhi’s Vision: Freedom and Beyond (2019), published by Niyogi Books. It covers the entire span of Gandhi’s activities from his life and movements in South Africa to his defining role in India’s freedom struggle and efforts to end communal violence and prevent the Partition of India. It puts his arrival and work in India in perspective by placing both in the background of the social, political, cultural and economic developments, and the reform movements that transformed India in the 19th century. It also dwells on the political movements that, gathering momentum from late 19th century and, involving direct action and the participation of a large section of the middle class during the movement against the Partition of Bengal in 1905, had laid the foundations of a national struggle that Gandhi transformed into a mass movement across the country. The distinguishing feature of the publication, which combines scholarly knowledge with accessible prose, is the large number of photographs it carries, covering the entire range of Gandhi’s activities. This gives it the character of a pictorial biography which vividly recalls a time of great stirrings and upheavals and the man with the stick and steel-frame glasses who played a defining role in it.